There are several encouraging statistics about oral health in Michigan, and these should not be ignored. For instance, Michigan has a long history of fluoridation, with Grand Rapids being the first city in the U.S. to enhance its water supply with fluoride in 1945. Michigan now ranks 15th in the country for access to fluoride-enriched drinking water. Michigan also ranks well, given its economic ranking among the states, in use of dental services. Just over two-thirds of adults visited a dental service provider in 2012, a few percentage points above the national average and 18th best in the nation. However, there are troubling signs, particularly when looking at specific population groups throughout the state. In a 2010 survey, nearly 30 percent of third-graders had untreated dental disease, as did 42 percent of third-graders in the metro Detroit area. Seventeen percent of these third-graders in metro Detroit needed immediate dental care. These data suggest that too many children in Michigan have dental problems and need access to care. But it’s not just children who need better access to affordable dental care; there’s evidence that seniors do too. A 2010 survey shows that 30 percent of seniors in Michigan had untreated tooth decay, most of which could be dealt with using basic dental procedures in a dental office. Furthermore, 45 percent of seniors had fair or poor gums because of gingivitis. Eighteen percent of seniors had a major or urgent need for immediate care. A 2013 screening of a sample of seniors found that 17 percent suffered from severe dry mouth, 16 percent had severe gingival inflammation, 17 percent had untreated tooth decay and 13 percent had root fragments. 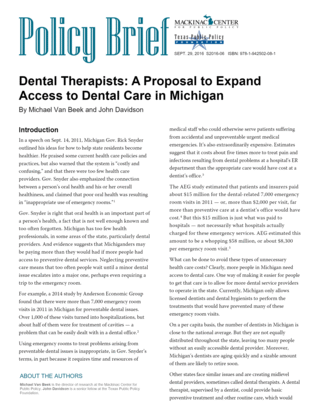 These data suggest that some pockets of populations in Michigan are not getting the dental care they need. And one of the main barriers to getting care is the cost. Nearly 90 percent of facility managers of retirement homes and senior centers said that the primary reason more seniors do not get dental care is for financial concerns. Only 56 percent of Michiganders have dental insurance, and the average out-of-pocket dental expense in Michigan in 2010 was $827. That’s 24 percent higher than the national average of $666. Reducing dental costs would go a long way to ensure that more people have access to the care that they need.